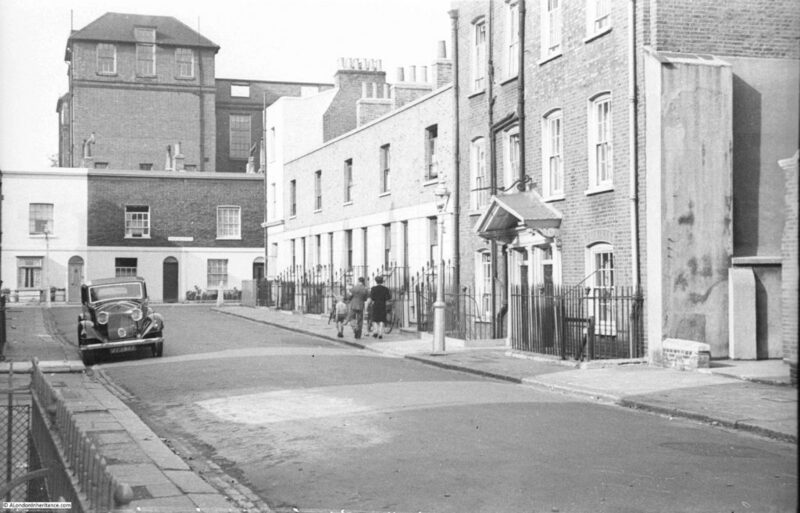 The streets north of Cheyne Walk in Chelsea were a centre for the manufacture and decoration of china during the 18th and 19th centuries. 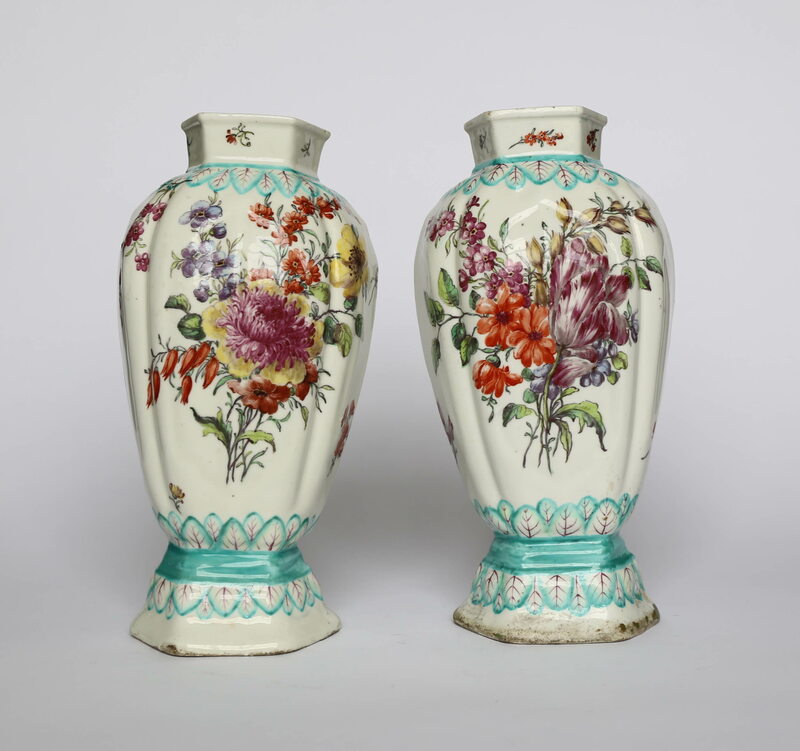 I wrote about one factory in my post on Cheyne Row, and in today’s post I come across another, earlier factory where Chelsea china and porcelain were manufactured in the 18th century. I was standing on the steps up to one of the houses to try to recreate the same view, with the railing shown to the lower left of both photos. The plant was growing up from the small garden space in frount of the house, I thought it best not to try to bend or break to remove from the view. The view is much the same (although whilst I was sure I was standing in the same place, the perspective is slightly different between the two photos, possibly due to camera and lens being very different). 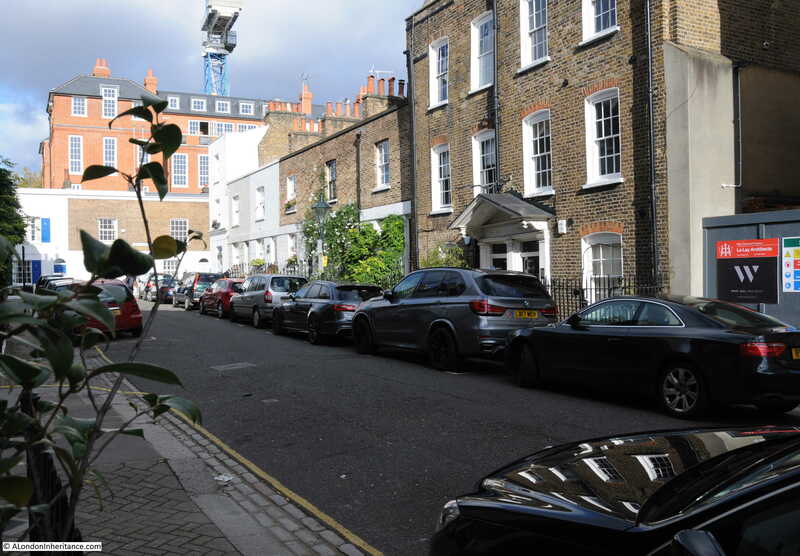 The major difference is the number of cars which now seem to line almost every street in Chelsea, making is really difficult to get good, full length photos of the buildings. The single car in 1949 has now multiplied many times. 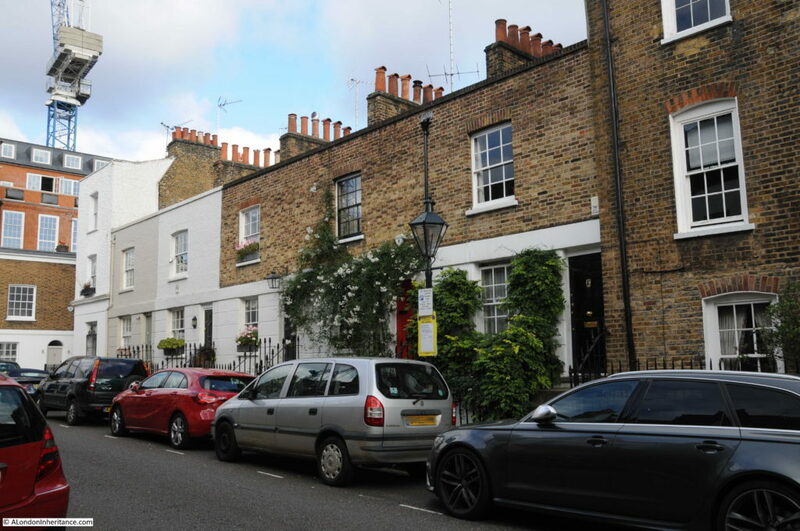 The street name comes from the Lawrence family who lived in the manor house that was on the land to the north of Lawrence Street and Upper Cheyne Row. 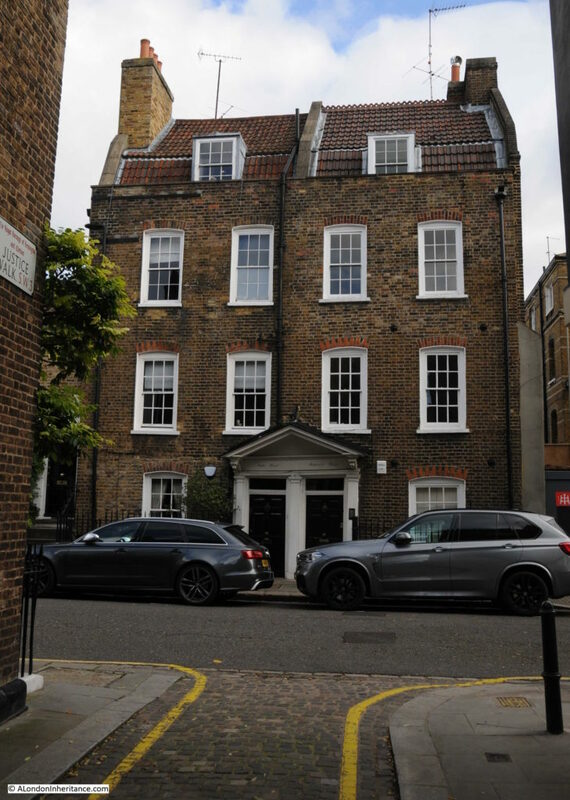 The first Lawrence to arrive in Chelsea was Thomas Lawrence, a London goldsmith who arrived in the sixteenth century, the manor remained in the hands of the Lawrence family until 1725. Thomas was originally from Shropshire, but moved to London where he married Martha Sage. They would go on to have eleven children, with only five surviving. The manor house was replaced by Monmouth House (after the Duchess of Monmouth who occupied the house on the site from 1714). 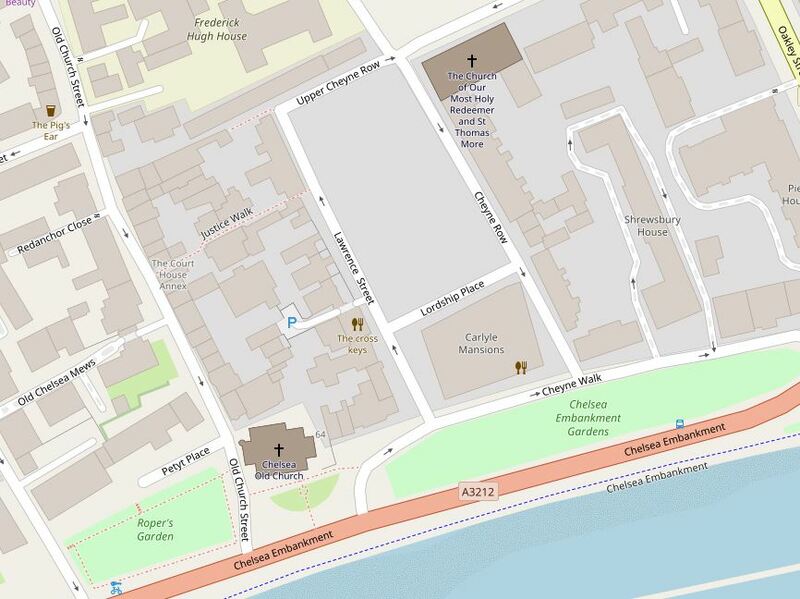 At the top of Lawrence Street is the junction with Upper Cheyne Row. From here we can look back on the houses on the western side of the top of the street. Tobias Smollett was a Scottish poet and novelist who originally had a career in medicine, including as a naval surgeon which provided the opportunity to travel widely. The plaque also makes reference to the manufacture of Chelsea China at the north end of Lawrence Street. It is not clear when the production of china started in Chelsea, however the first recorded owner of the Chelsea china works was Charles Gouyn who arrived at the works in 1745. In 1749, the works were managed by Nicholas Sprimont who had arrived in London from Belgium. Originally a silversmith he changed his trade to working with clay. 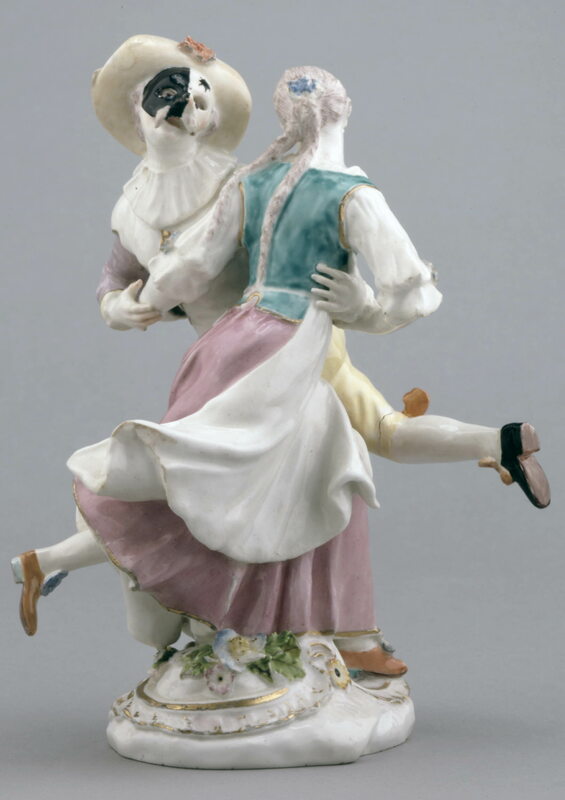 His influence changed the design of Chelsea china, with his experience of the design of silver products being mirrored in the designs of Chelsea china and porcelain. 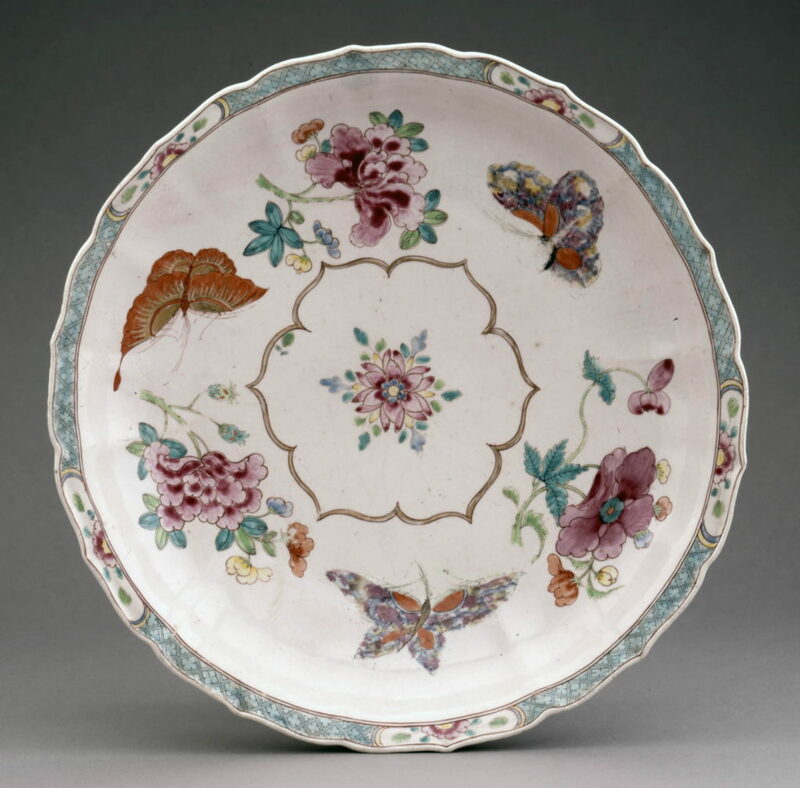 The range and output of the Chelsea China Works increased steadily during the 1750s and received Royal patronage from George II. Royal support continued with George III who purchased a dinner service for the considerable sum of £1,200 as a gift for the Duke of Mecklenburg-Strelitz. Nicholas Sprimont retired a wealthy man in 1769 and the Chelsea China Works was taken over by William Duesbury who had apparently arrived from Derby. 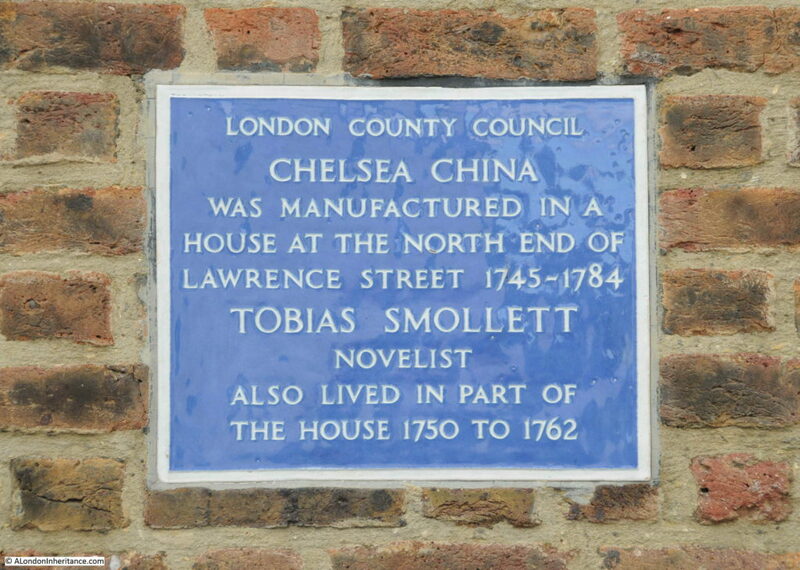 Duesbury ran the Chelsea works for a further ten years, however in 1779 the lease on the factory premises expired, and within five years the Chelsea China Works closed. William Duesbury returned to Derby, taking many of the moulds with him, and the buildings of the china works were demolished. 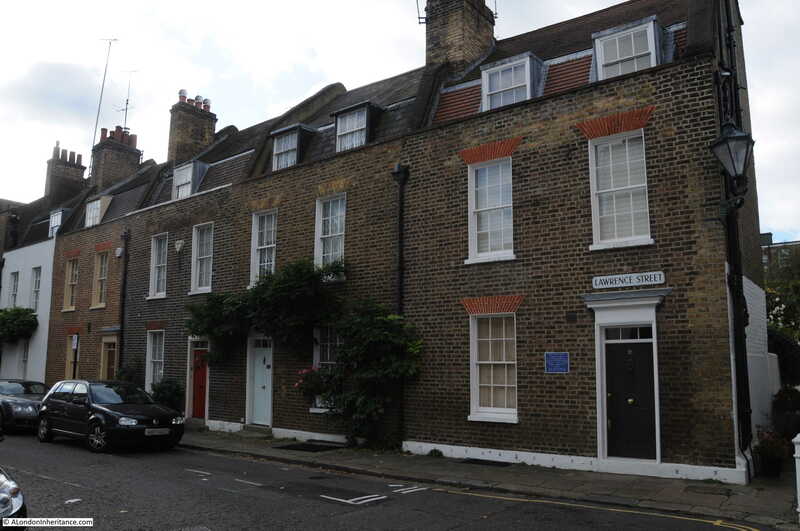 Fragments of china were found in 1970 in the garden of number 15 Lawrence Street (the house to the left of the house with the blue plaque) which helped to confirm the location of the Chelsea China Works. 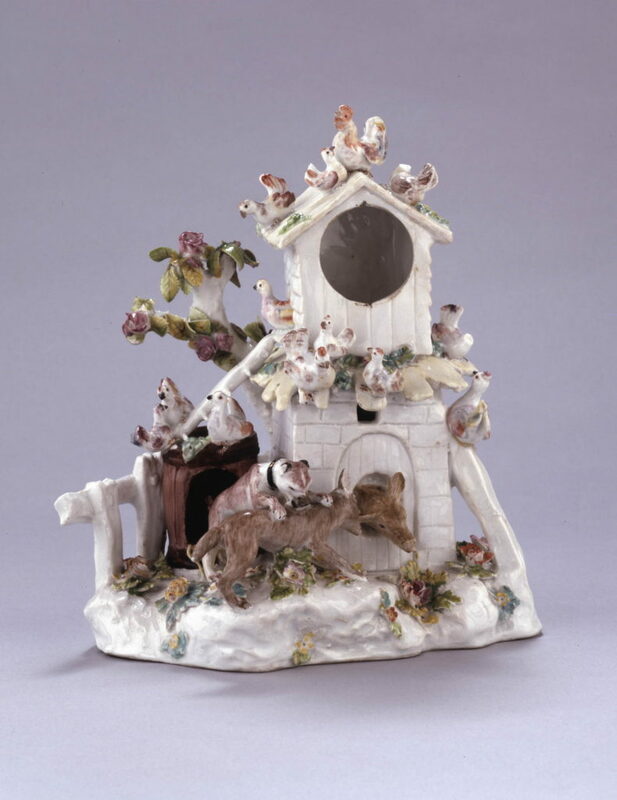 The British Museum has a number of examples of the output from the Chelsea China Works, starting off with one of the earliest examples from 1745 – a “goat and bee” jug made from soft paste porcelain. Goats are on either side of the base and a bee is climbing up to the lip of the jug. 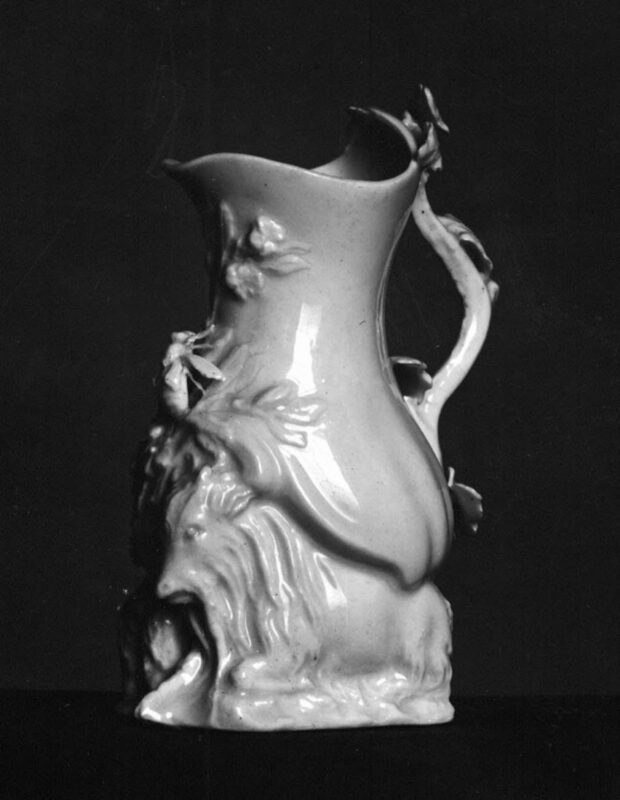 For a brief period, Chelsea was manufacturing china and porcelain probably as good as anywhere else in the country, however after the closure of the Chelsea works, it was the factories around Derby and Stoke-on-Trent, where companies such as that run by Josiah Wedgwood would further develop the technical skills and scale of manufacturing to continue in business for the following centuries. Lawrence Street would continue as a quiet, residential street. This entry was posted in London Streets and tagged Chelsea China, Lawrence Street on March 4, 2018 by admin. A wonderful article, thank you. In the 1950-60’ s we used to rummage the foreshore, like mudlarks and on any piece of accessible uncovered shore we’d find pieces of porcelain. Some later identified as being scrap from the potters along the Thames. What a lovely photograph your father took, only one car in the street! Oh happy days of yore! I was away last weekend and have been on ‘catch up’ since so would like to belatedly congratulate you on your sterling blog posting,not forgetting your Granddaughter’s first excellent effort. Thank you for a lovely interesting and informative article.